The Los Angeles County Sheriff’s Department responded to a call at 1:05 a.m. Monday that a person not breathing. Emergency responders performed CPR at the scene, they said in a statement released on Monday by the sheriff’s office, but the man — whose identity has not been publicly released — was declared dead at the scene. The sheriff’s office said that the cause of death in this case has yet to be determined. New Jersey Gov. 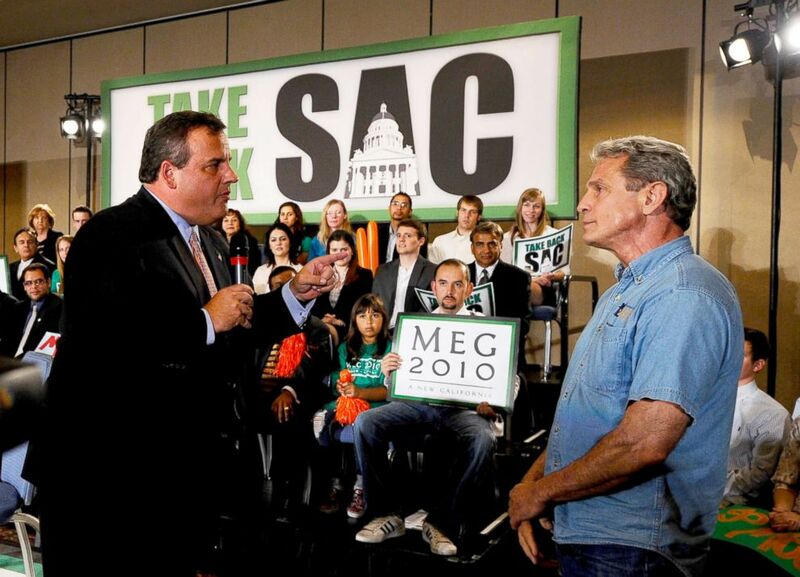 Chris Christie, left, confronts Ed Buck who disrupted California Republican Party gubernatorial candidate Meg Whitman’s campaign event, Sept. 22, 2010, in Los Angeles. The death has prompted another look at the July 27, 2017, death of Gemmel Moore, who the sheriff’s department reports was found to have overdosed at the home of Buck. Buck’s attorney Seymour Amster did not immediately respond to ABC News’ requests for comment, but he spoke to ABC station KABC. “This is not a situation where Mr. Buck has caused the death. This is a situation where Mr. Buck has had longtime friends who unfortunately do not handle their life well,” Amster told KABC. “From what I know, it was an old friend who died of an accidental overdose, and unfortunately, we believe that the substance was ingested at some place other than the apartment,” Amster told the Los Angeles Times. “The person came over intoxicated,” he told the newspaper. Protesters gathered at Buck’s house Monday night demanding answers, and action. “It’s clear that there’s a pattern and a practice of Ed Buck to prey on vulnerable, young black gay men who are homeless, who are HIV positive, who he can manipulate with his money, and they end up dead inside his house,” activist Jasmyne Cannick told KABC. The Los Angeles Times obtained the Los Angeles Coroner’s report relating to the death of Moore,which stated that the man was found naked on a mattress in the living room and he had died of an accidental methamphetamine overdose.